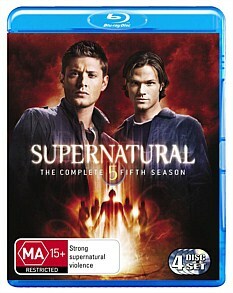 The casual viewer would be forgiven for entering at the fifth season of Supernatural and having no idea what’s going on. The apocalypse is in full swing, Lucifer is free from hell, and brothers Sam and Dean Winchester (Jared Padalecki and Jensen Ackles) are supposed to be the vessels of the Devil and his brother Michael. It sure is a far cry from the show that was about two guys hunting demons in the first season. In addition to this as the series has come along, there have been an increasing number of meta-moments, where the show references itself and fan reaction to the show. But for fans of the show, this season was hotly anticipated. It was meant to be the last one (Not the case anymore) and wrap up five years of enjoyable storytelling. So how did it go? With a few big hits, a few big misses, and a few patches of mediocrity. Spending any season dwelling on the apocalypse must raise expectations. Epic battles are afoot, and there is usually an added sense of urgency to stop all of these happenings. I say usually because one of Supernatural’s biggest problems this season, is that it really doesn’t seem apocalyptic in most episodes. Sure there are lots of references to the end of days, and many long talks about Lucifer and Michael, but apart from that it seems like business as usual. Some of this obviously stems from the fact that the show didn’t have the biggest budget, and thus couldn’t make every episode seem like the world was ending. However there are way too many episodes where Sam and Dean focus on regular hunts like nothing was happening, or not enough visual influence to show nay noticeable change. It’s one thing to state over and over that the apocalypse is happening, but there isn’t really enough showing. Consequently, it’s the episodes that do show the full effects where things are at their most urgent. ‘The End’ which shows the devastating effects some years later as Dean is transported into the future is one of these, as it perfectly explores the ideas of loss of hope and the effects Lucifer has had on the world. ‘Abandon All Hope’ is another, bringing a much needed “epic last stand” feeling. What exemplifies the problems mentioned earlier the most would probably be the episode that follows ‘Abandon All Hope’. A big battle with Lucifer with casualties on either side is followed by a stand alone story about the boys checking into a mental asylum to hunt a run of the mill demon. The episode itself is fairly standard, but it’s placing takes away from the looming threat the Winchesters face. However this season does have a few big winners such as ‘The End’, but the best episode of the season would be ‘Changing Channels’, the big Supernatural TV parody episode. The plot, involving Sam and Dean being placed into various tired TV clichés, such as CSI Miami style procedurals and bad sitcoms, combines the standalone aspect of Supernatural and ties it in to the larger arc of the plot. It also does this while being absolutely hilarious throughout it’s entire run, and featuring two of the best performances from Padalecki and Ackles, who clearly seem to be enjoying parodying some of the biggest hits on TV. Picture wise, everything is up to scratch. There aren’t many pixilation’s in the effects, and the whole series comes through nice and clean. Presentation wise, the DVD menu’s seem a little odd, forgoing the usual episode listing by title with just a number. It may be easy to navigate, it just looks like a little less effort went into the package. Sound quality is also good, dialogue is clear and the staple of Supernatural, classic rock, comes through well. So Supernatural Season Five can be a bit hit or miss. When it hits, it is everything that has been great about Supernatural for the past five years. When it misses, it’s pretty forgettable stuff really. This season contains a few more misses than previous, but it’s still a whole lot of fun. If only These bright spots are enough to make the season enjoyable as a whole, even if it is maddeningly inconsistent in parts. Supernatural is still enjoyable, still funny, still scary and still has an emotional core of its show to keep viewers interested.